A postcard from our friend, Rachel who is on holidays in Western Australia at the moment. 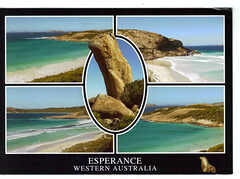 Esperance is located in the Goldfields region of Western Australia, about 700km southeast of Perth. The Dutch vessel Guilden Zeepaert passed near here in 1627, but the first landing by Europeans was made by Bruni d’Entrecasteaux who was commander of the French Ship L’Esperance in 1792. In 1979, the local shire council fined the U.S. Government $400 for littering when pieces of the space station Skylab crashed into the area after it broke up over the Indian Ocean. Thanks for the postcard, Rachel! Make sure you keep an eye out in the sky, and don’t let any space junk fall on you! Here’s a link to the map of Rachel’s journey to date.